Welcome to Talk Classical - A community covering every aspect of classical music! You are currently viewing our boards as a guest which gives you limited access to view most discussions and access our other features. By joining our community you will have access to post topics, upload content and access many other features. Registration is absolutely free so please, join our classical music forums! I thought of a new thread. We should list those DVD and Blu-Ray versions of operas that are absolutely the best version by wide consensus; the really definitive, authoritative productions that leave the competition miles behind and may go unmatched for many years to come. We should only list those productions that have earned the TC Opera forum members' almost unanimous endorsement, or if not almost unanimous, at least by vast majority. These three happen to be recent productions, but old timers are also welcome - those productions that are so good, with such great singers, orchestras, conductors, and stage directors, that most of us feel that they are precious parts of any collection, the kind we'd take to the proverbial desert island. We've had similar threads - one about each person's top 6 DVDs, for instance - but I think the difference here would be that I'm not interested in individual opinions (in the idiosyncratic sense). I'm interested in those DVDs and blu-rays that are so amazingly good that *many, many* members vouch for them. Of course, I do welcome individually-driven *nominations* (that's what this thread is for), but then there should be some discussion, and the other members should agree that the particular production is memorable enough and is enough of a consensus to deserve to be on the final list. Say, if at least 80% of the thread participants agree that it belongs there. We have had a top-100 recommended *operas* - regardless of production. Now we could get to, say, the top 20 recommended productions on DVD or blu-ray. Maybe there aren't 20 that would achieve such wide consensus; maybe there is just a handful of these; or maybe not, maybe there are many indeed, and this thread will be our way to dig them out and give them the applause that they deserve. So, what other DVDs or blu-rays could be considered to have reached wide consensus among us? Operetta, but I doubt anyone could argue againt the Dessay Orphee Aux Enfers being best by a wide margin. The nature of this thread implies that the operas here are likely to be relatively more popular ones in order for the general consensus to be credible. Yes, I can agree with those three versions listed above by the OP. No doubt. I'll put forth a popular opera. Bizet's Carmen. Another Glyndebourne Opera House production with Anne-Sofie von Otter. Agreeable or are there better versions out there? I endorse the Dessay Orphee Aux Enfers. The comic flair of that version makes it completely unbeatable. Regarding the Magic Flute, I think some people have other versions in mind. I'm not as sure about consensus for that one. Even though I certainly disagree, it seems like many prefer the abridged version in English translation from the Met. I'd put forth Saariaho's L'amour de Loin if I might be so bold. Thing is I don't know any others. When in God's name is Enescu's Oedipe going to be video-recorded??? Whether other versions of Carmen are better or not, is not what is to be debated. It's rather whether there is wide consensus on just one version among our membership, and unfortunately, in the case of Carmen, I don't think so. I've seen people talking about the Antonacci/Kaufmann version, or one of the two Maria Ewing versions, or the Fra label one from Sir Gardiner with Antonacci as well, etc. It's hard to reach a consensus with Carmen. I'm saying these things just to express my opinion, it's not because I'm the OP that my ideas should prevail, I'm aiming for a membership consensus. It's too early to tell, we need to wait several days for more members to speak up, and then things will start to fall in place. I'd certainly hope that Anna Netrebko and Villazon's L'Elisir d'Amore would qualify, since I find it vastly superior to other versions. And while my preferred version of La Traviata is the Salzburg 2005 one with the same couple, I know that I can't propose that one because many here dislike its updated setting so there is no consensus. Another one that might approach unanimity would be Der Rosenkavalier with Kleiber conducting, and Fassbaender, Jones, and Popp. I guess the Ring is too complex for consensus, but I've seen lots of people picking the Barenboim Ring as the best current version. Last edited by Almaviva; Jan-12-2011 at 06:04. L'Amour de Loin - that's an easy consensus because there is no other version that I know of, and the existing one is praised enough to qualify, I think. The recent Met production of La Damnation de Faust is not yet out on DVD but when it is, I believe it will gather wide endorsement. It's on MetPlayer for now. I would find this very useful because in many cases I've only got one version on DVD of an opera. 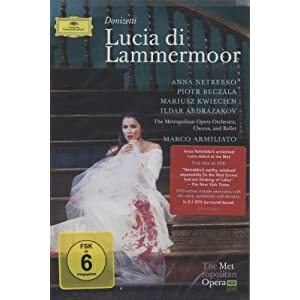 I have seen several Lucia di Lammermoor though and think this is the best of what I've seen so far. Would the Dessay Fille du Regiment count? I guess the only serious competition would be from the Joan Sutherland version, but I've not seen it and don't know how good it is. Probably the easiest way to come up with likely operas is to think not of really good versions, but to think of operas that have a limited selection available on dvd. For example, there's so many versions of La Boheme that it's unlikely everyone can agree on a single version being best. I'd also add the von Stade film of Rossini's La Cenerentola, a definite winner. How about the Met '00 Don Giovanni? Or the Losey film? I know that it's not the stated purpose of this thread, but I agree. As a more ambitious and long-term project, having votes on as many operas as possible and recording the winners in a stickied single thread would be fantastic. Then if you're in the mood to buy something, you can just consult the thread to find one that, even if it's not the best for your specific tastes, will likely be very, very good. A definitive list would take months, but even a more modest list would be hugely helpful to people such as myself who only own a dozen or so on dvd. Just start with the most popular operas and go from there. As a more ambitious and long-term project, having votes on as many operas as possible and recording the winners in a stickied single thread would be fantastic. Then if you're in the mood to buy something, you can just consult the thread to find one that, even if it's not the best for your specific tastes, will likely be very, very good. I'm digging the idea. It wouldn't be too hard - nominations, a few words on the choices (perhaps a discussion? ), and then finally, a poll... and we've got our top nomination. It would be a superb reference, I agree. And then, between the top 100 recommended opera threads and the top opera recordings thread, we've got the perfect ingredients for creating or building a superb opera collection. We could even combine them, using the top 100 operas list as a reference to decide which operas we're going to determine the "best recording" for. Bohm's Strauss: Salome and Elektra. While this is a slight different idea from my initial one, I like this development or evolution. Initially I thought only of the hors concours versions, those that are so amazingly good that they gather broad endorsement. What you're proposing would include those that are "preferred" versions, in spite of not reaching the wide consensus I was talking about. But it is relatively easy to combine the two ideas. It would be similar to what www.rottentomatoes.com does. If we proceed by nominations and polls, then it would be enough to establish a threshold percentage for the final winner to be considered hors concours, just like Rotten Tomatoes does when they say that a given movie is "certified fresh" as opposed to being just "fresh" or "rotten," when its positive reviews are above a certain percentage of the total reviews (I believe that their threshold is 66% - would have to check to make sure - but we might go for something higher like 75% or 80%). Then, we'd have a final list that would be the combination of the two ideas: each opera would have a winner, but those winners that had reached the wide consensus would be highlighted in bold font or font of a different color or would have an asterisk next to them. And a way to be organized about it would simply be to proceed one by one down our top 100 list - we'd start with The Ring, then Tristan und Isolde, and so forth. We would give a number of days for nominations and discussions and then would fire up the poll, establish the winner, and move on to the next opera. The only caveat is that I'm not sure if we can start polls in the middle of a thread, or if the poll function is only possible when it's done at the head of a dedicated thread. If it's the latter, we'd create a monster that would take 101 threads to be accomplished - one for the discussions and nominations, and one for each of the 100 polls. Moderators, can a thread incorporate multiple polls in its body, not just in the original post? Membership, what cut-off should we pick to consider a version as deserving of the wide consensus endorsement? 66%? 75%? 80%? Another caveat is the fact that operas with large number of DVD recordings would be less likely to reach the "certified fresh" threshold, but that's the nature of the beast. I don't think it invalidates the idea, because the effort here is to identify those amazing DVDs that *clearly* beat the competition, and if there isn't one given too many versions, well, then they only deserve to be listed as poll winners but not as consensual versions. The other side of this coin is that versions that have only one recording would have an unfair advantage. This is a valid objection, I think. L'Amour de Loin, for instance, while outstanding, gets the advantage of no competition, and is conceivable that as soon as someone else records another DVD of it, it could be an even better one. The remedy for this is to only grant the "certified fresh" highlight to those versions that have, say, at least two other competitors. Finally, what would be the "title" given to our "certified fresh" versions? We can't plagiarize Rotten Tomatoes... we should come up with a way to call those that qualified. Simply calling them hors concours versions would do, but maybe there is a more creative label. Doesn't that poll method presuppose that we buy DVDs based on what is the best version by "wide consensus"? I don't... Because even though such a consensus might say an older production of an opera with a cast of Pavarotti, Sutherland etc is unarguably the best, I probably still won't like it, because I'm generally not a fan of older productions with lesser sound and image quality. Maybe the majority will think it's a great idea to have such polls, but I fear it will turn into another attempt to "get rid of" individual taste in favour of an "objective" truth. I didn't meant for that to sound very aggressive..I'm not mad at anyone, I just don't think it will work. And, I prefer the Copenhagen Giulio Cesare with Andreas Scholl to the Glyndebourne one. All times are GMT +1. The current date and time is Apr-24-2019 23:18. TalkClassical.com © copyright 2006-2019 All Rights Reserved.